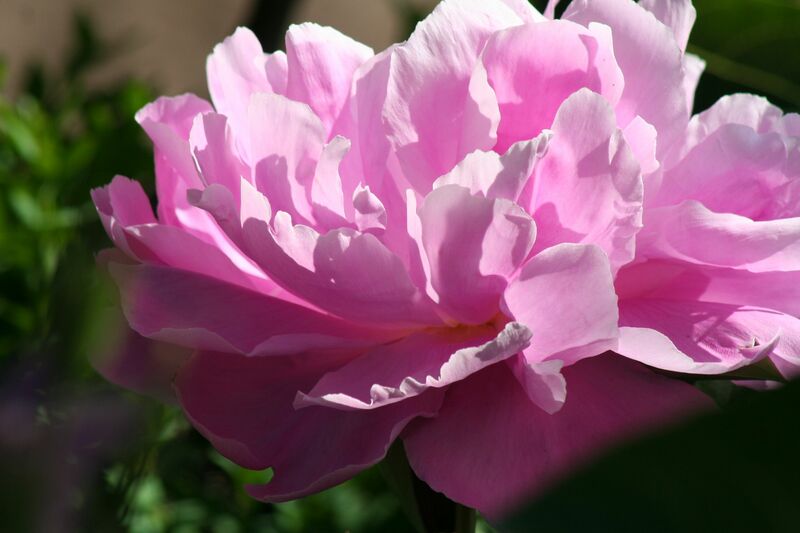 It’s a big decision as you will live with it for a very long time and it will form the structure of your garden and is costly if you change your mind. The best advice I can give on this is to drive around your district and take note of what others are using. Take your time. Do you prefer evergreen – a sharp edged conifer, a nice glossy cherry laurel or flowering camellia – or would you be happy with the elegant structure of a beautiful wall of deciduous hornbeam or beech with their russet winter leaves giving way to brilliant green in early spring? 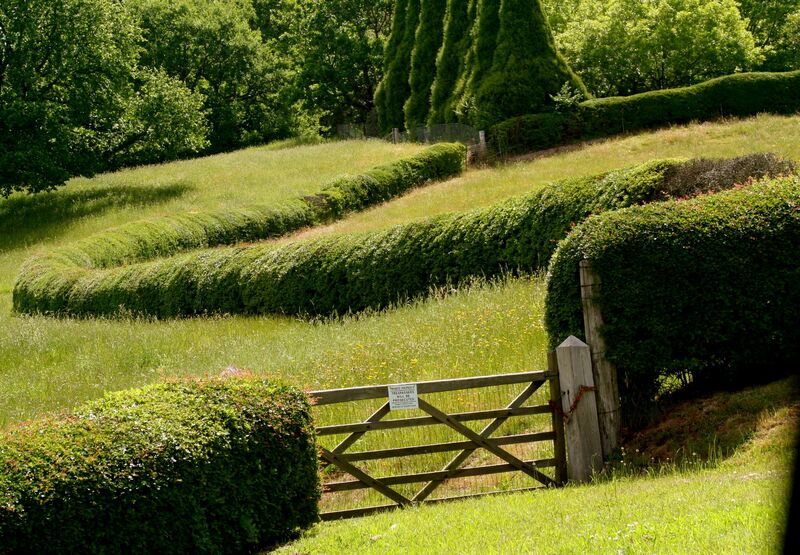 Whatever it is, it must match both your property and your budget as some need a lot more management than others and hedging on a large scale can be a considerable cost each year. Hornbeam (Carpinus betulus) is my absolute favourite and will be playing a big part in future sections of our garden. It is not commonly used here in Australia as a deciduous hedge probably because people prefer beech, which it does resemble. But, the expert view is that hornbeam makes a superior hedge to beech, particularly, if you want to pleach or train it. 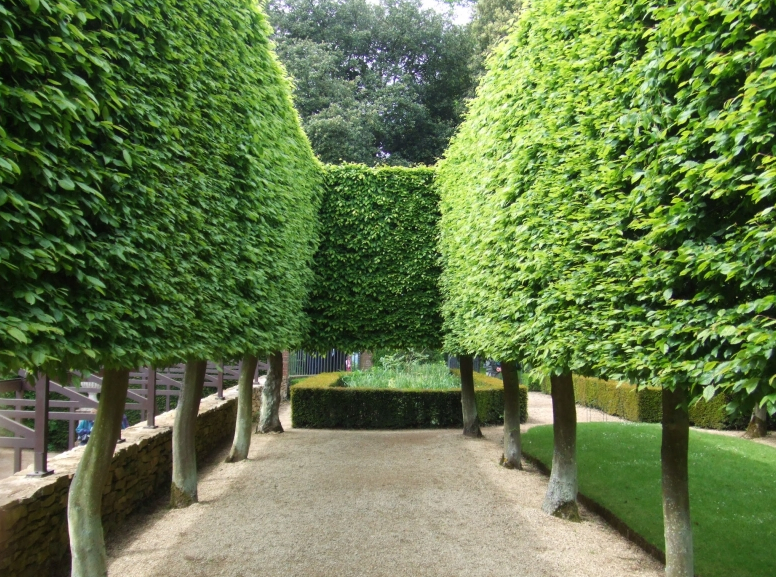 I saw what is probably the most famous example of a pleached hornbeam hedge at Hidcote in Gloucestershire last year. 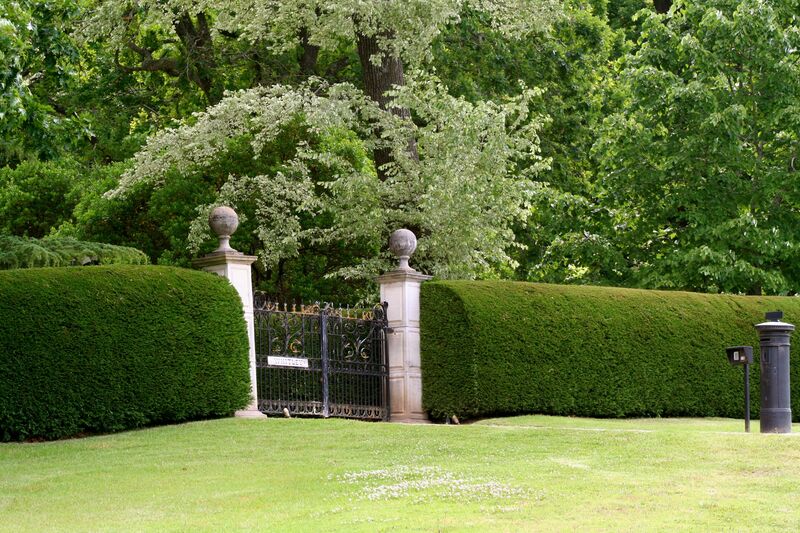 There, a pair of hedges is raised almost 2 metres on pleached trunks. It is fantastic to see and well worth a visit next trip to England. Both hornbeam and beech keep their leaves through winter though the hornbeam is a paler shade of russet than the beech – then in spring the brown leaves make way for a startling show of the freshest green you can imagine. Either will grow happily here in the Southern Highlands and a great example to view, winter and spring to see the colour contrast, is at the lovely gardens at Red Cow Farm – open daily from 10am. People think it’s too slow, but hornbeam will grow very fast if it has plenty of moisture, particularly when young and it does respond well to a rich, well-prepared ground. It will also grow well in heavy shade, though a little less luxuriantly than in full sunlight. We are endeavouring to source some advanced hornbeam hedging at The Potting Shed – and hopefully some specimens on stilts which are great if you need to block out a new house on your boundary or screen where trees have been removed next door. 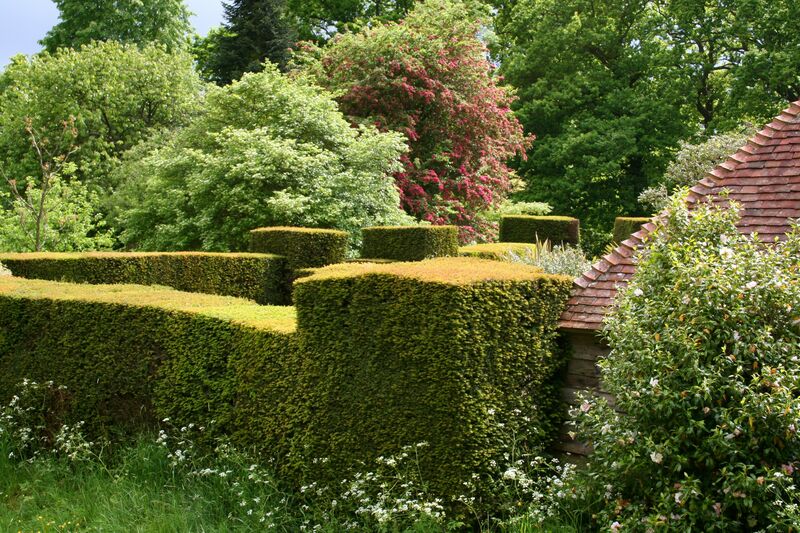 Above: the beautiful yew hedges at Great Dixter. Unfortunately yew doesn’t like the Australian climate and dies back. But there are many good conifers that will give you this firm, precise structure. Mature Height: 5-10m Sizes estimated at 10 years, and may vary depending on growing conditions. Aspect: Full sun/semi-shaded. 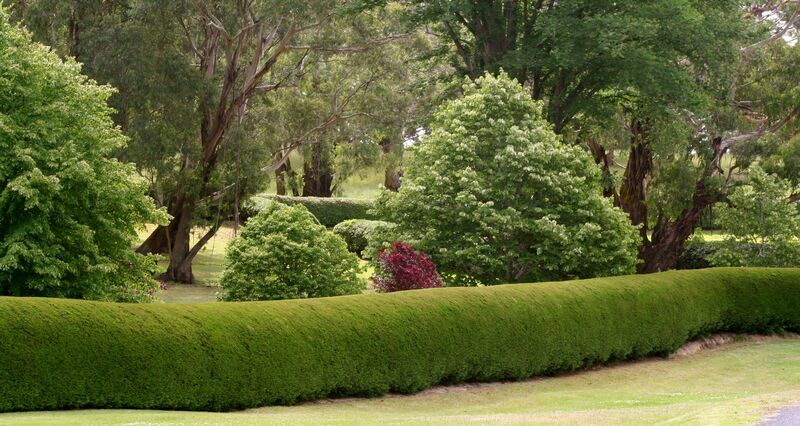 Nice deciduous tree, used as formal hedging in cooler areas; conical in shape when young, becoming rounded with age. Mid-green serrated-edged leaves, with pale undersides turning a greenish yellow autumn colour; yellow catkins prominant in spring. Avoid hot sun and don’t allow to dry out in hot weather.